It’s about this time of year that I start wondering what will happen to all of the pumpkins dotting the fields and filling up all the navigable space in the aisles of the grocery store where I shop. Weird enough that on Hallowe’en, instead of turning pumpkins into delicious soup and/or pie, people turn them into perturbing twisted semblances of human faces. But then the pumpkins get tossed. Ideally composted, but sometimes not even that. That’s even weirder. Food waste in general is a huge issue in North American culture. There’s also comparatively little interest in it, not least because the most obvious ways of solving the problem undermine the systems of supply and market demand that North American economies are based on. According to the David Suzuki Foundation, almost “half of all food produced worldwide is wasted.” Irony can’t be figured as a percentage, but if it could, I think we would all agree that with food insecurity ranking high on the list of major global issues, that percentage would be high. Add the fact that the amount of food wasted globally per year would be more than enough to feed all of the people on the planet who currently go hungry every day, and the irony levels go off the charts. Or they would, if this all felt a little less deliberately uncaring on the part of agribusinesses and food manufacturers. The burden on landfills is immense. The Environmental Protection Agency states that 33 million tons of wasted food ends up in landfills in the U.S. every year. 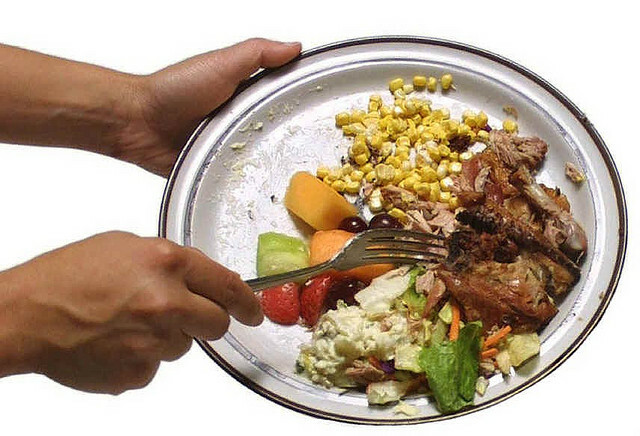 Food waste in landfills also plays a huge role in greenhouse gas emissions, particularly methane. The Food and Agriculture Organization of the United Nations (FAO) estimates that the carbon footprint of all of this wasted food is 3.3 Gtonnes of CO². I don’t know what a Gtonne is. It sounds big. 3.3 of them is apparently more than all the greenhouse gas emissions produced by road transportation in the U.S. If food waste was a country (this isn’t a joke—this is a figure the FAO came up with), it would rank third in the world for greenhouse gas emissions, just behind China and the U.S. Add to that all the resources (like water) that are wasted in producing food that nobody eats, and the impact adds up. The David Suzuki Foundation tells us that about 30 per cent of household food is thrown away each year. It also tells us that about 30 per cent of fruits and veggies don’t end up on shelves in North America because they’re not attractive enough for the average North American customer. So there’s plenty to do on an individual level to help curb food waste. It’s important, though, not to let those with real control over the food supply system off the hook by downloading responsibility for the problem onto ourselves. Me composting the banana I forgot about is just not as effective a step as every grocery store composting all of their unsaleable bananas. Or banana companies producing fewer bananas. As individuals, we’re just the end stop of a long chain of stops between someone planting a banana tree and me eating one of the resultant bananas. Pressuring food companies and businesses who deal in food (like restaurants, for instance) to adopt better food saving strategies would go a longer way. Waste audits, mandatory donations of food that won’t be used and company composting are all methods that could be adopted to ensure that the food that’s grown in our world gets used. To get that done, however, would require a big shift in corporate culture. It would mean prioritizing the environment over profit; being willing to let people have unsold food instead of trashing it in order to keep prices up, even producing less food and distributing it more equitably. Those things are fairly anathema to corporate culture, but to make real changes, it can’t just be about making the agricultural system more efficient. It also has to be about sharing the wealth we have. Food rescue programs like Second Harvest, FareShare and White Pony Express are on the ground examples of how to solve two problems in one: food getting wasted and people going hungry. Even grocery companies are starting to look into the possibilities. The UK’s Tesco, for one, has embarked on a program to divert what it calls surplus food to local charities to help fight hunger. It’s hopeful. With a little more persuasion, we might even make it standard to turn one food “problem” into a real solution.